Antarctica is an important location for studying Space Physics. In the southern hemisphere and the Australian longitude sector, Antarctica is the only large land mass where instruments can be placed between the pole and Tasmania. The Antarctic program for collecting space physics data does include instrumentation on Macquarie Island. The Antarctica science program is maintained and supported by the Australian Antarctic Division. The Space Physics Group uses data recorded in Antarctica by magnetometers, the Southern Hemisphere Imaging Riometer Experiment (SHIRE), radars and auroral cameras. The magnetometers record the signatures of low frequency plasma waves propagating in the magnetosphere. Putting together data from magnetometer spatial arrays can provided clues to the propagation and generation mechanisms of these waves and energy transfer into the high latitude ionosphere. 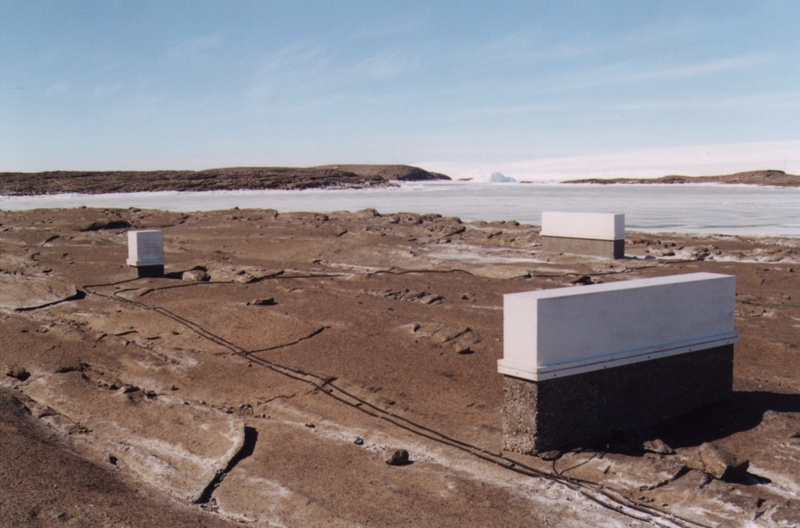 A typical induction magnetometer at Mawson is shown on the right. In the Pc3 band (10-100 mHz), it has been found that both coherent and incoherent waves are resident in the cusp and boundary layers. The coherent portion has been identified by wave propagation characteristics between spaced stations in Antarctica and the Arctic, including interstation phase, coherence and polarization. We have found that these signals may represent the signature of external sources in the upstream solar wind, or cavity or waveguide mode oscillations in the outer magnetosphere. The incoherent signals are characterised by a small scale size and are probably generated by fluctuations in the precipitating particles in the boundary layers. Comparison of conjugate Pc3 and Pc5 data indicate common wave packet structure in the 30 mHz and 5 mHz bands, again supporting the concept of closed field line oscillations. However, while the 5 mHz pulsations are most likely field line resonances, it seems unlikely the 30 mHz signals are higher harmonics of this. Another Pc3 study using time delays measured between a wider network of spaced stations (Casey, Davis and Mawson), has again shown that the dayside boundary layer is a source of at least some Pc3 ULF waves of upstream solar wind origin. The wave energy spreads across the ionosphere at apparent speeds of a few tens of km/s. This speed can be interpreted as a time delay between two different paths by which compressional and Alfven wave energy may reach Davis and Mawson from a sub-solar magnetopause source. Detailed studies of Pc5 field line resonances using a small network of magnetometers near Davis have revealed a pattern of longitudinal phase characteristics that can be related to resonance structures for magnetic activity (Kp<3), when the Davis region is under closed field lines. At times of higher geomagnetic activity this phase pattern collapses, indicating that the network is under open field lines. These studies have provided a valuable introduction in the use of ULF waves as boundary region locators and may be employed in space weather diagnostic studies. Conjugate studies of low azimuthal wave number Pc5 waves between Longyearyben on Svalbard, and Davis and Mawson at times of low Kp show a phase relationship that places the Longyearbyen conjugate point midway between Davis and Mawson. This agrees with the T87 model and the technique is being used to compare measured conjugate locations with geomagnetic field models.